Duh! So simple, so obvious, so right under my nose, but I remained oblivious. Yes, I could be talking about almost any part of my life, but in this case, of course, I’m talking about pasta. I recently visited the quaint, perfect, and charming Osteria Monti in Rome. It features the cuisine of Le Marche, the province northeast of Lazio: La Cucina Marcheggiana, as they say. And there I again realized, over a delectable bowl of delectable, that even the simple addition of a single ingredient could change a dish completely. 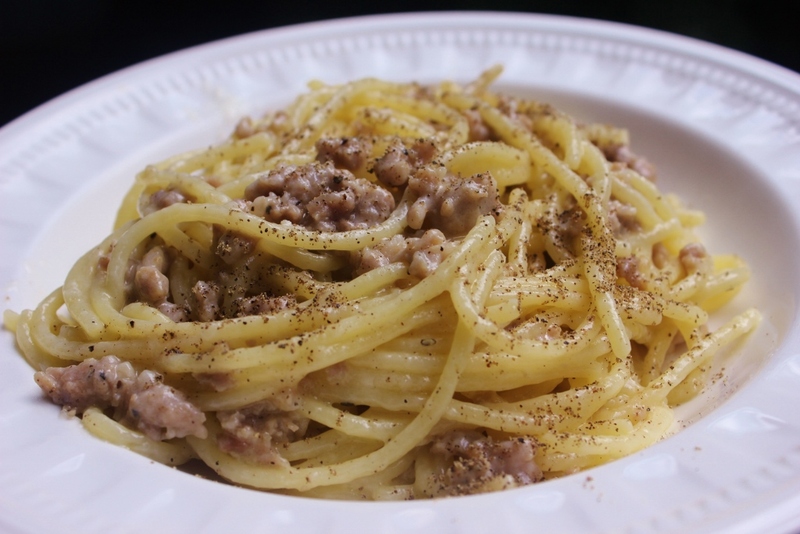 Duh, why hadn’t I thought to add sausage to my Cacio e Pepe? Who knows?You can thank me for pointing out the obvious. This week’s Sunday Pasta is obviously delicious. Duh! In a large skillet over medium heat, add the olive oil and then the sausage. Using a fork, break the sausage into small pieces (as small as you would like). Add the Pecorino to a bowl. Cook the pasta until al dente (about 2 minutes less than the package directions). While it’s cooking, take 3-4 tablespoons of the water and mix into the Pecorino, creating a creamy mixture. Stir in the pepper. Drain the pasta and reserve some of the cooking water. Add the pasta to the sausage skillet over low heat, making sure not to fry the spaghetti, but rather only to mix together. Mix in the cheese and pepper, and add a bit more of the reserved cooking water, as necessary, until a creamy consistency is achieved. Add more pepper to taste. Wow! Haven’t had this dish since I was a little girl! & the family would all be together at my Grandparents house on Sundays. I remember my Mother, Grandmother & all my Aunts in the kitchen making Sunday dinner & this pasta dish, when it was made, was a special highlight. So simple, yet so delicious. Can’t wait to make it again! great!! love it. let me know how it goes!